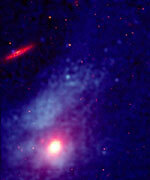 A new image taken by the Chandra X-Ray Observatory shows the elliptical galaxy M86 and its 200,000 light-year long tail. This gigantic galaxy is located in the Virgo galaxy cluster and moving 4.8 million kilometres per hour through clouds of gas in the cluster. The Virgo cluster is hurtling away from us, but M86 is on the opposite side and being pulled into it, so the net effect is that M86 is actually one of the few galaxies actually moving towards our own Milky Way. The galaxy is no longer an “island universe” with an independent existence. It has been captured and its gas is being swept away to mix with the gas of the cluster, leaving an essentially gas-free galaxy orbiting the center of the cluster along with hundreds of other galaxies.